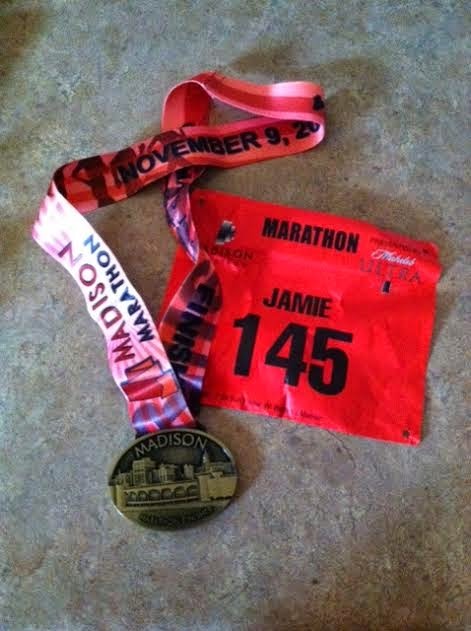 Sunday, November 9 was scheduled to be my eighth full marathon. 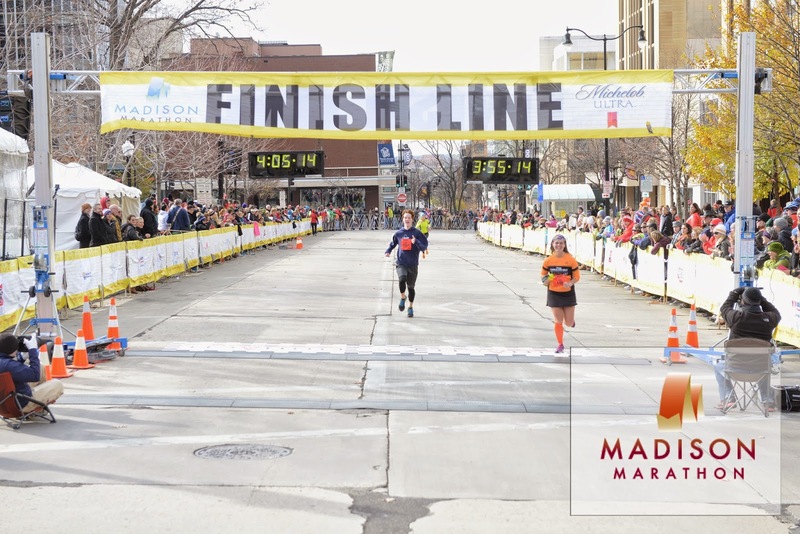 I had run the Madison Marathon in the past. However, it was previously held in the Spring and typically experienced extreme high temperatures. The event had been moved to the fall last year, because of this. 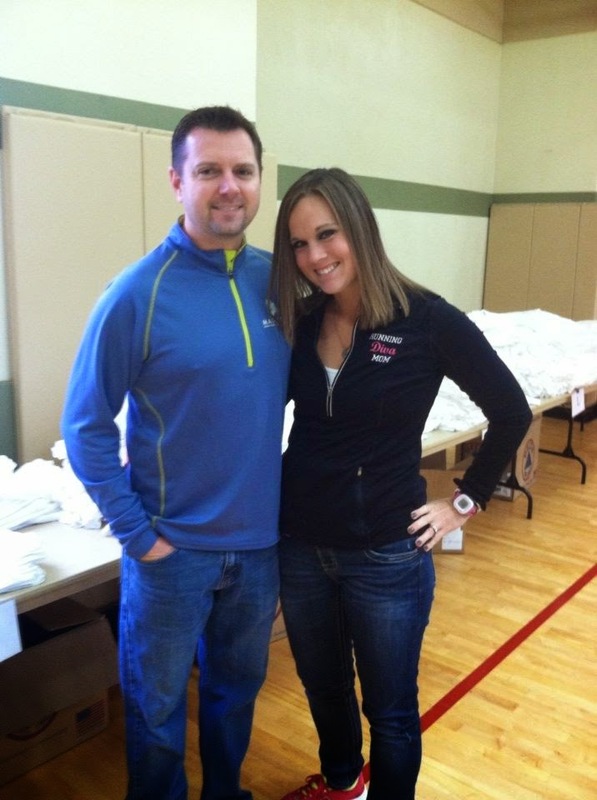 On Saturday morning, hubby and I volunteered at registration for the Girls on the Run - Dane County. 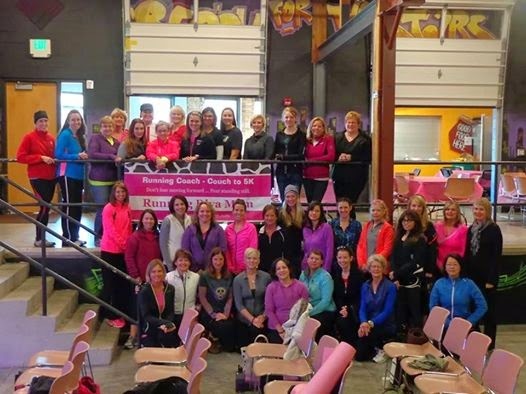 GOTR is one of my favorite organizations and it was great way to start our marathon weekend. We then headed to the Warner Park area to drive the last portion of the marathon course. To eliminate the long and open course on John Nolen Drive, they had extended the course further north, through the Warner Park area (which is hilly). We drove this part of the route and then headed to the Monona Terrace for packet pick up. There were only a small number of booths, so we were in and out really quickly. We then walked down the street to Paisan's for some delicious carb-loading at one of our favorite restaurants. We spent the rest of the fall day at home on the couch and computer. We chilled out, added songs to our playlists, charged GPS and ipods, planned out our race outfits and carb-loaded some more with an at home baked potato bar. We both had jitters, so we took Nyquil at 6:30 to help make us sleep. We were both out before 8:00 pm. 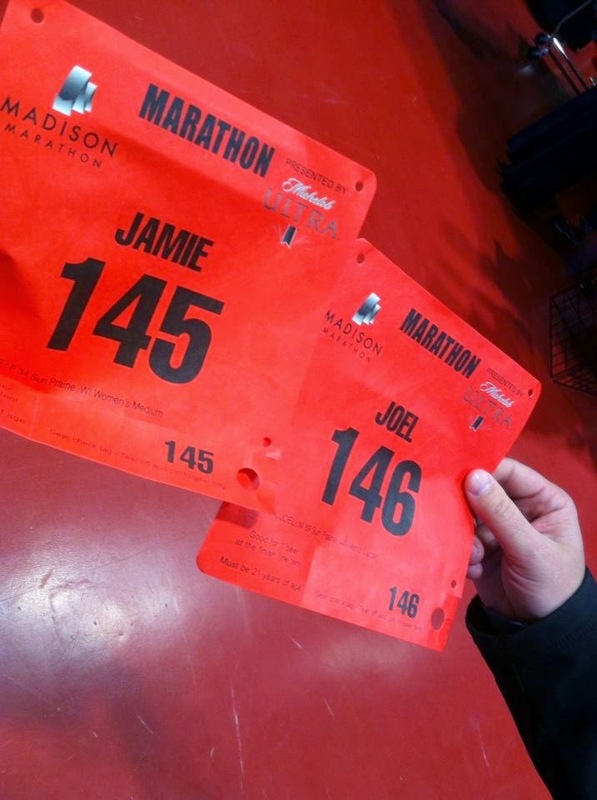 When the alarm went off at 5:00 am, we were both rested and ready to tackle the day - and a marathon. We woke up and I applied my makeup and waterproof mascara (of course!) and then headed downstairs for breakfast. I have trouble chewing before a race, so I downed two containers of greek yogurt for the calories and two pieces of buttered toast. I paired a half cup of coffee with some Powerade Zero. I also took in a Advocare Slam in the car and a few energy chews. Our friend, Dwight arrived at our house around 6:00 AM and we were out the door around 6:10 or so - after four or five trips to the bathroom. We parked just east of the Capital in a parking ramp and walked around the square to the startline. I had turned my GPS on in the car and had to keep refreshing it. I didn't want it to turn off and I didn't want to wait until the race started to get a satellite. It's always so difficult to fire that thing up at the startline, with everyone doing the same thing. Hubby had our post-run gear in a drop bag and we were looking for gear check. Couldn't find it and walked right past it. We headed towards the port-o-pottys and I pointed to some trucks that I thought were the gear check. Told him I'd use the bathroom and would meet him at the startline. I was wrong. Oops. I reunited with a friend in the port-o-potty line and rushed to the startline as the National Anthem was being sung. We were cutting it close. I found my spot near the 4:00 and 4:20 pace groups. This course was hilly. My PR from a few years back on a flat course was 4:02 and my slowest was 4:37. I was hoping to do somewhere around a 4:15. So, I was hanging in between the two pacers. I messed around with my ipod. And the nerves started to set in as the announcers kept counting down minute by minute. Just then I felt a tap on my shoulder and got a peck on the cheek. 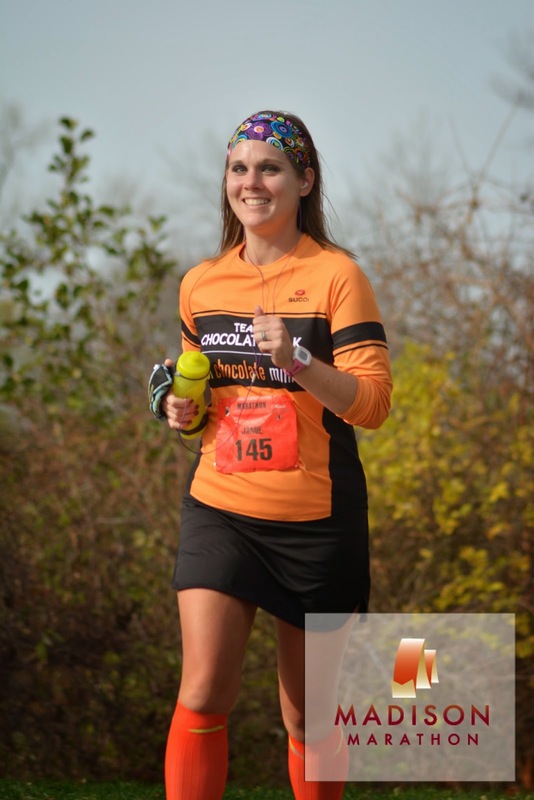 My hubby had found gear check, used the port-o-potty and found me at the startline. YES - we could start this together. 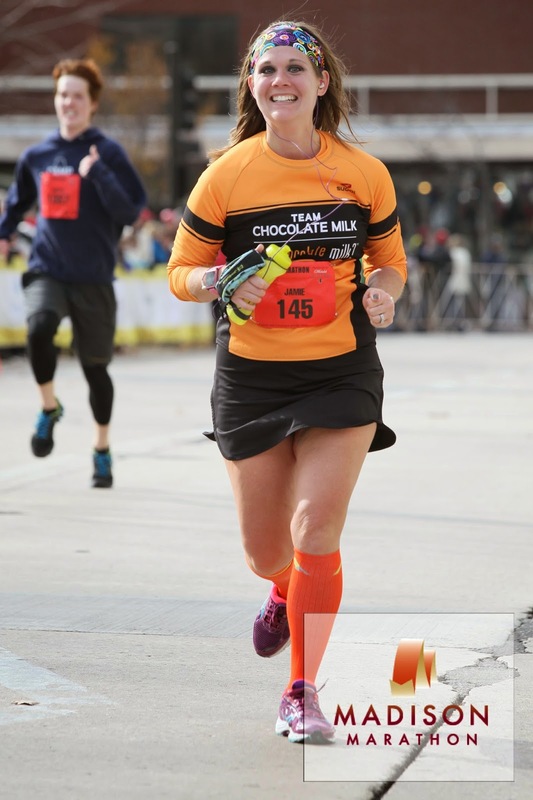 Hubby had ran the Lakefront Marathon a month prior in 4:09 and has had a bum foot ever since our long run three weeks before. He took off the whole week before the race and taped and iced his foot daily. He was in pain, but was hoping to push through the marathon this morning. We set the expectations that we would start together and if one of us was feeling better, that we would run our own race. He is a lot faster than me. But I have more races under my belt and am able to endure the distance longer and more consistently. So we started the race together at 7:00 am and we were off. We rounded the capital and my bladder felt full. Ugh - already??!! Really??!! My ipod was in closed-caption mode and was starting to recite each of my playlists and the songs in it, over the music that was playing. After a half mile, I figured out what was going on and it was fine for the rest of the race. My bladder was feeling fuller and fuller and I wasn't sure if I was going to be able do another 25 miles of this after we saw the first mile marker. 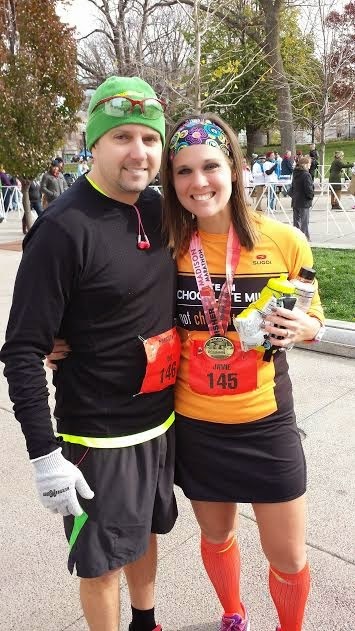 At mile 2 I mentioned my discomfort to my hubby. And he nodded his head. I had never used the bathroom in any event and didn't want to start now. Eventually by mile 9 I forgot about it and didn't end up using the restroom after the race or until after my shower at home. 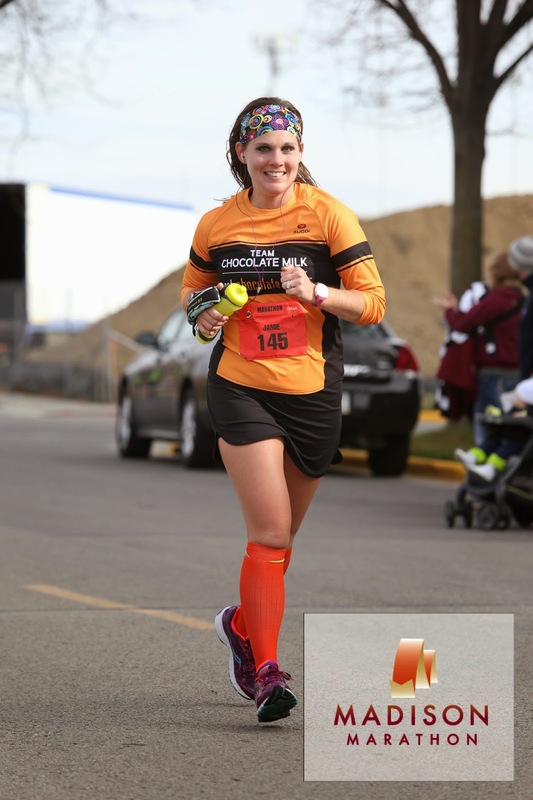 It's funny what your body does during a race like this. At mile 2, we saw my parents at the water station at the UW Arboretum entrance. 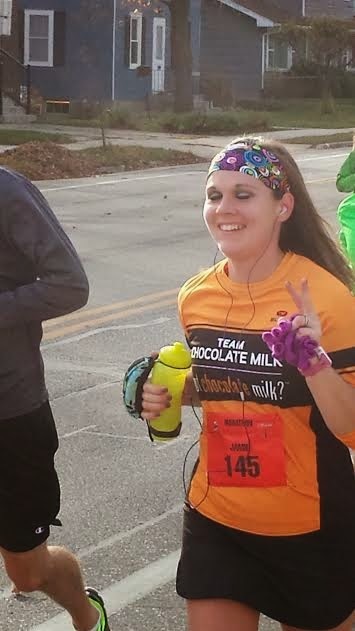 I had to call out to my mom, as they didn't spot us in the sea of runners. And then we headed into the lush Arboretum. I was carrying my handheld water bottle and had it filled with water. I decided to pick up the sports drink when I needed it at the water stations - something that I didn't use during my training runs. I also started out with a stick of gum and had more in my handheld water bottle for later, along with four Gu Energy Gels. I didn't plan to pick up any gels along the course. In the Arboretum we saw Julia and her team of angels, pushing a wheelchair for My Team Triumph. The energy was high in the Arboretum. Those couple of miles were rolling hills that I was used to. We then headed out the Arb and down the hill past the golf course and onto Monroe Street. The spectators were out, but nearly what they were in year's past. Maybe it was the cooler temps. The forecast was previously for low to mid 30's and freezing rain. The forecast had changed to a high of 45 and a mix of clouds and partly cloudy. Perfect for running. Not necessarily for spectating. I took my first gel around mile four or five. I would sip on my gel over 2-3 miles and then toss the packet at an aid station. And then one mile or so later, it would be time for another. 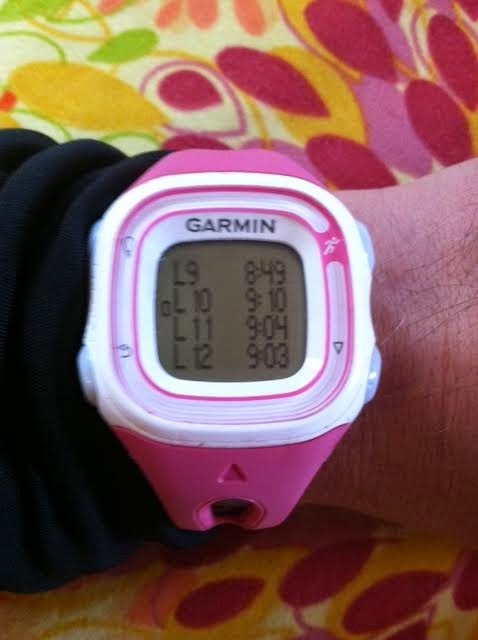 I did this throughout the race and it provided me with constant energy, even when my legs were on fire from the hills. I shouted out to my parents again on Monroe Street. We were ahead and then behind the 4:00 pace group. This happened for the next several miles. I was using the portions of flat road and downhill to my advantage, and then they would pass me up hills. Hubby and I also went back and forth of who was in front of each other. He was in front me more than not. I passed the 10K (6.2 mile) mat at 56:19. We headed past Camp Randall and down Old University Avenue where cars were stopped and lined up and frustrated. Someone trying to deliver newspapers was angry with the police officers that had traffic stopped. We then headed through the UW Campus and on Observatory Drive. My parents parked and ran out of their vehicle near the Natatorium. They were excited that they were just in time to see us again. Then we headed up the big hill on Observatory Drive. 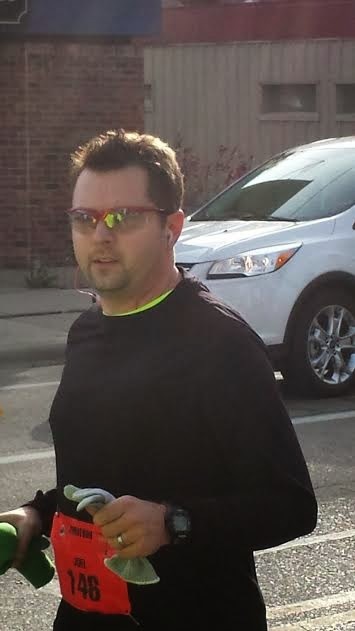 The pack of 4:00 runners passed me again. One-step-at-a-time!!! What goes up must come down (usually) and it did. We headed down Charter Street to the next water station, where mom and dad were cheering for us again. Hubby was significantly ahead of me and I could tell that my parents were concerned and looking for me. I smiled and waved to get their attention. I caught up to my husband as we turned up on University Ave which was flat. We passed State Street and headed on rolling hills towards Tenney Park. The spectators were many as was the race support. Hubby and I were together and ahead of the 4:00 group at this point. We passed Tenney Park onto Sherman Avenue. We saw my parents two more times on Sherman Ave, where it's easy for spectators to park in one of the many business parking lots and drive along the course. Sherman Avenue felt long, but I welcomed the flat course. I was wearing a short sleeve technical top under my long sleeve and my core felt warm. 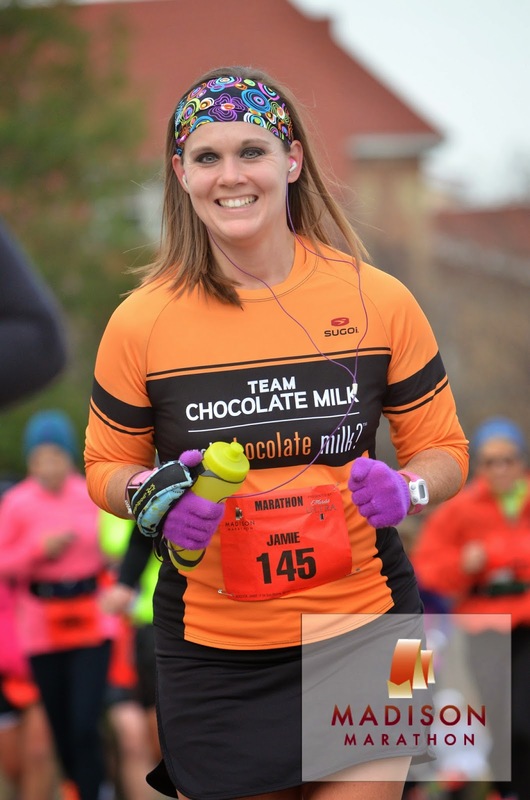 I wished I had just worn the long sleeve at this point, but also knew that my body would cool down later and that I would need the extra layer. At this point I tossed my gloves to my mom and knew that my husband was behind me somewhere. I was feeling great along this long stretch and was going with it. I crossed the half marathon (13.1 miles) at 1:58:51, which was actually pretty consistent with my recent half marathon finishing times. My parents saw my husband along this stretch, but I wouldn't see him again until after the race. We turned into Warner Park on the northside of town and the wind was brutal and in our faces. I felt myself slowing down and it pushing me backwards. We turned onto Northport Dr and then on Troy Drive and meandered through neighborhoods. 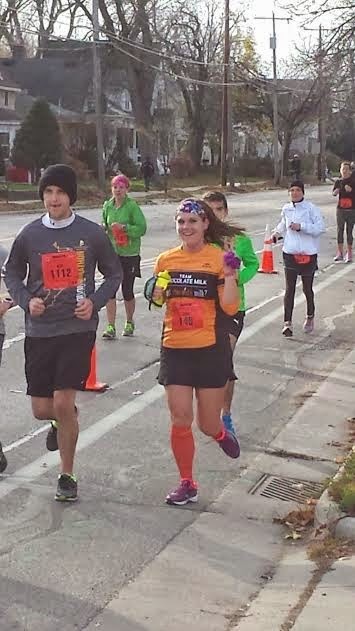 At mile 16 I felt myself slowing down, as I sipped on another energy gel. Had I pushed it too hard the first half? The 4:00 pace group passed me for one more and final time. I couldn't catch them. And decided that I wouldn't try to. I took a couple of deep breaths along this boring portion of the course (neighborhoods aren't my favorite) and turned up my tunes. I decided just to let them go until they were out of my site. 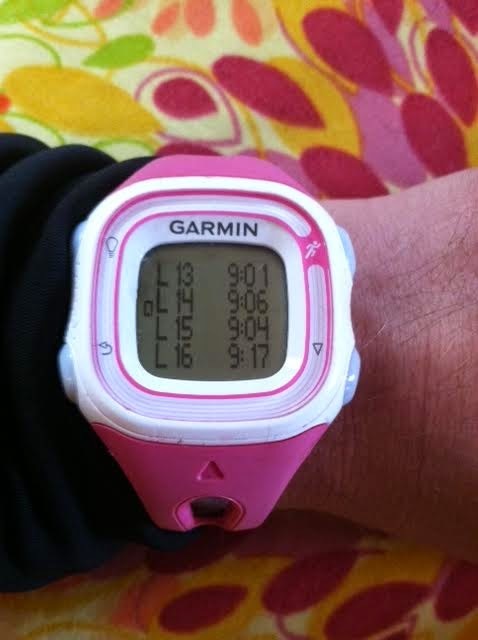 4:00 wasn't my pace goal anyway and I still had ten miles to go. Deep breath. This is your race, Jamie! 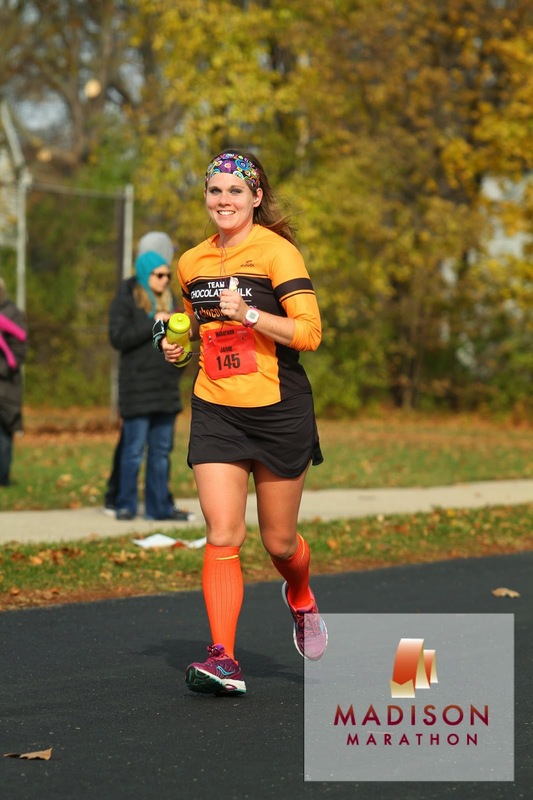 We headed out onto portions of the Fall 15K course that I've run before - and the portion of that course that I don't like so much. Boring neighborhood course and lots of hills. And they even added extra hills in there. This was an out and back portion, so I saw the 3:30 group coming at me. They were struggling. Wind was obviously in their faces and you could tell that the hills had taken a toll on them. Tiff smiled at me and called my name. I mustered a wave. 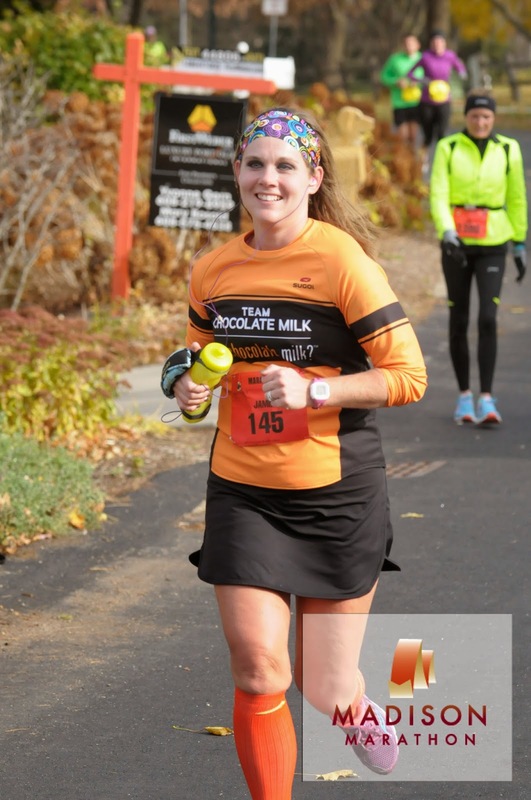 The next couple of miles were my least enjoyable of the race (even more so than the finish). It was brutal and there were still many miles ahead. But I pushed through it. Got my feet in a rhythm with my breathing and my tunes and took each step at a time. My pace was slowing down. Earlier in the race I was clipping each mile at 9:00-9:15, which is unheard of for me in a long distance race. Now I was hovering close to 9:30-9:40. I headed out of the neighborhood in to that headwind near the Mental Health Institute, where I saw the faster runners earlier. A friend, Jen, called my name and I barely mustered the energy to give her a wave. I took a few more deep breaths and pulled myself together. I enjoyed the downhill and some sports drink at the next water station. I got a boost of energy and enjoyed the run along the lake and trampled the fallen leaves on the ground. We headed back out to Warner Park on the path there. There were a few spectators scattered throughout the park. Mile 20 came and went quickly. I had some good tunes going on my ipod and started mouthing the words quietly out loud to myself for the next mile. I didn't care. 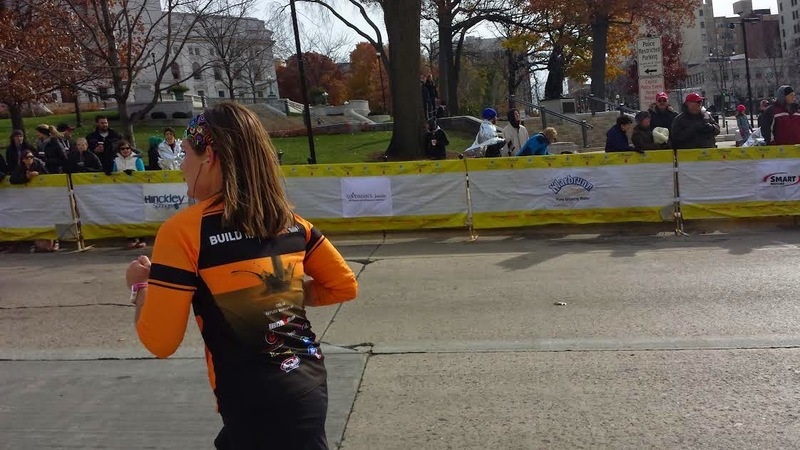 Most folks hit the wall at mile 20. 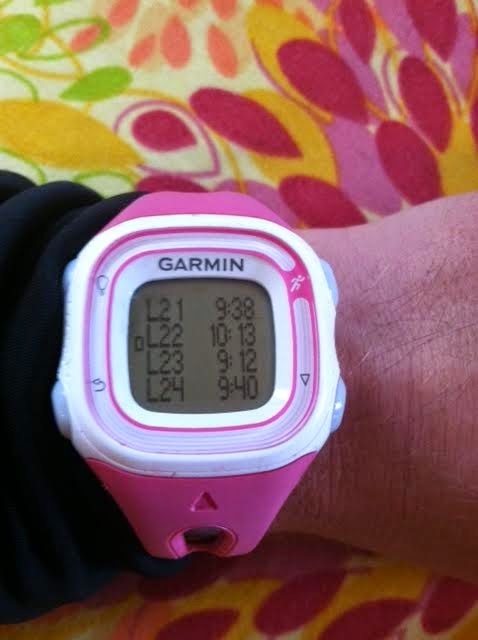 This is typically the furthest you have run during your training cycle - three or four twenty mile training runs. I've done this before. I've got this. We headed through the park and up another large hill in the park, that is used for local cross country events. Cruel. Then we headed onto road and down a huge downhill and into Maple Bluff. The downhill was welcome, but I didn't want to speed up too much to lose my balance and fall. There were rolling hills around the golf course and through Maple Bluff. Everyone around me was walking up the largest hill in Maple Bluff. I was not. I was the only one around me that was running. I started counting backwards from thirty in my head - and I conquered the hill. And then enjoyed the downhill again. I saw the lake and Capital straight ahead. It was beautiful. Then I realized that it was on the OTHER side of the lake and that's where we were finishing. Ugh - I had to run that whole distance to the Capital. This is where I finally stopped counting how many miles I have covered - and instead counted how many I still had to run. FOUR. 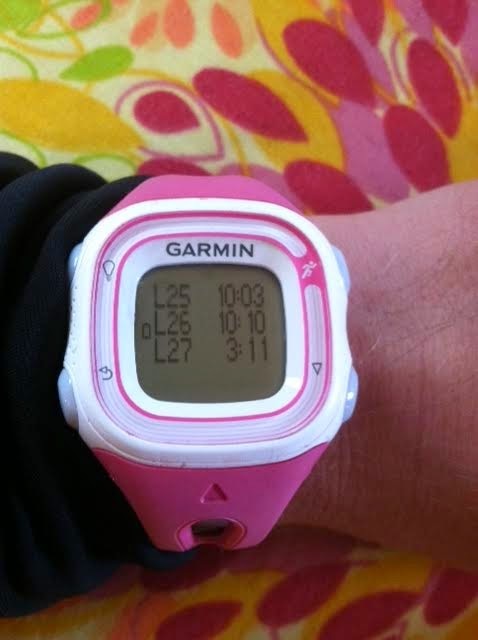 My hip flexors were starting to tighten up and my legs were feeling heavier. But I still had tons of energy. 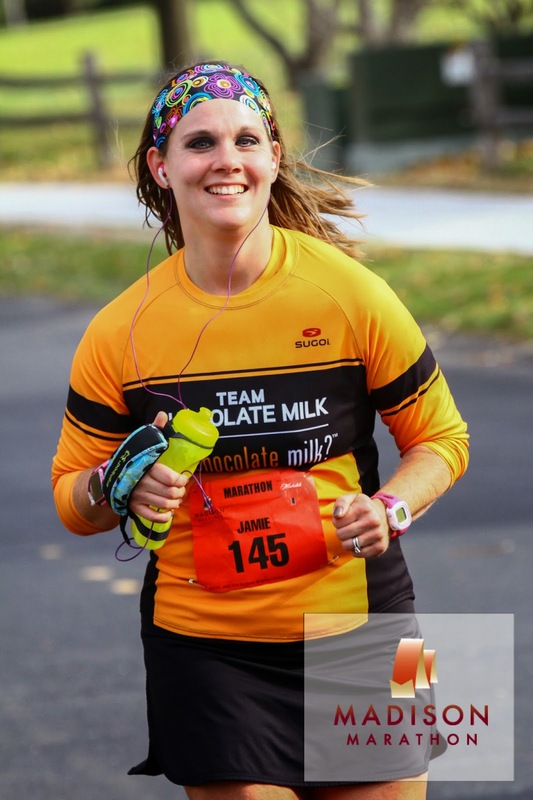 I really think that sipping on those gels throughout the race helped me. 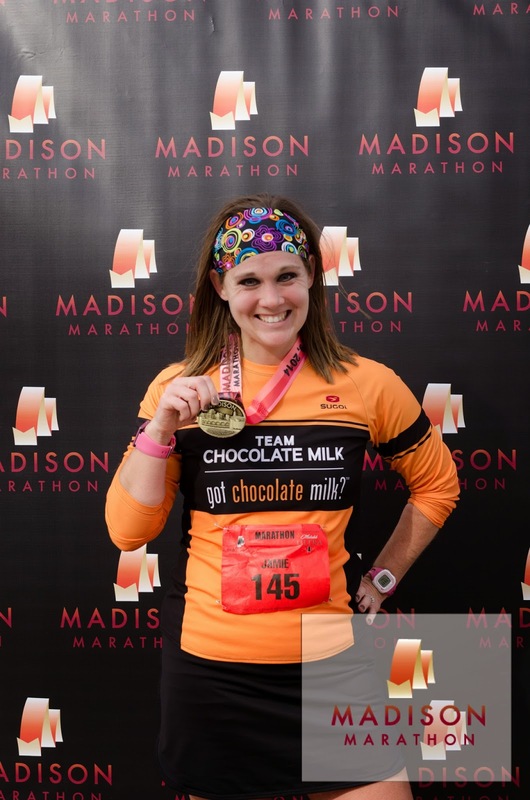 I had one gel left and previously told myself that even if I felt nauseous and like I couldn't consume one more gel at mile 22 - that I was going to take it. So, I ripped off the tab and started consuming it. 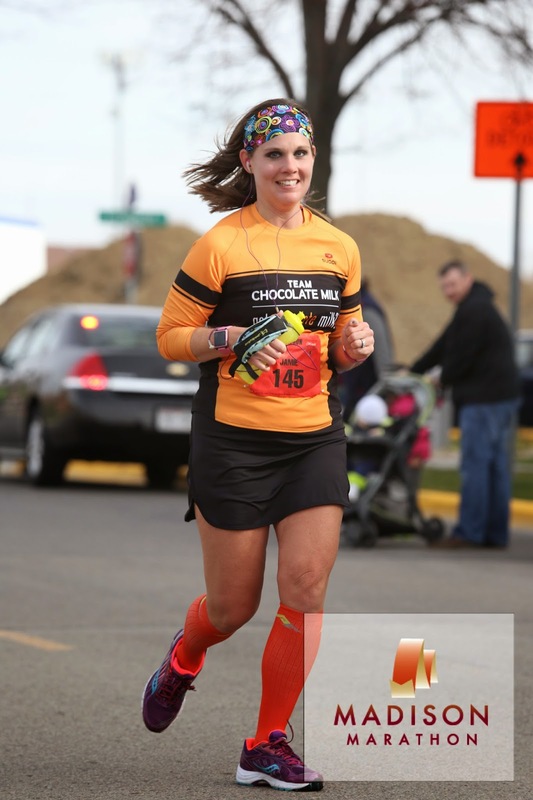 It gave me that last bit of energy that I needed for the last portion of the race. 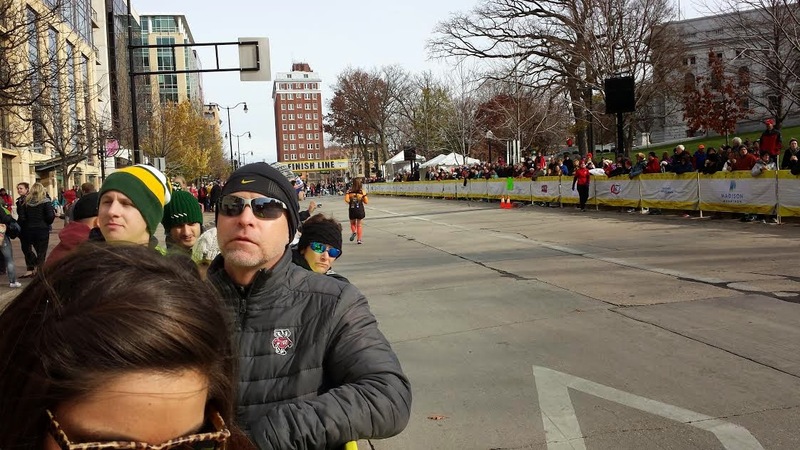 I was at mile 22 and a man was walking very slowly in front of me. I pointed at the sign and said "Hey, we only have four miles to go. We've got this". He nodded and started running. Then he passed me. I said, "Hey, nice job - but I didn't say you could pass me!". He laughed, jogged a little and then he stopped. I didn't see him again during the race. I enjoyed a flat mile and passed the Governor's mansion. We headed back out onto Sherman Avenue and through Tenney Park. Just after mile 24 we turned onto Mifflin Street. 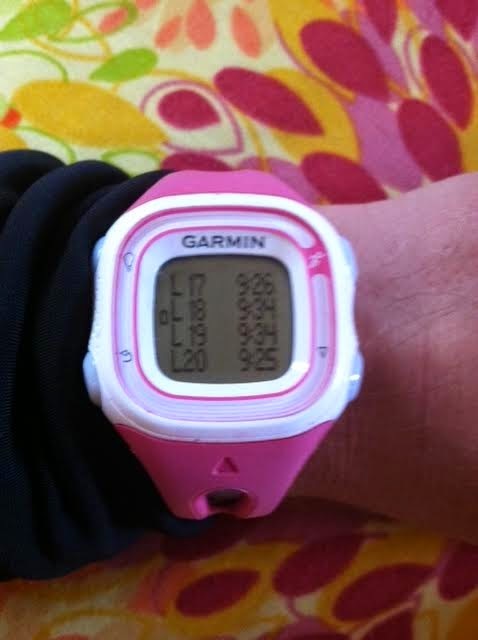 My Garmin started beeping at me and was yelling "battery low". Ugh. It was running out of juice, even though fully charged. Weird, since I'd done plenty of 20 mile runs with now problem. It did end up lasting through the finish and the final two miles. I saw a man peeing up against a building and then realized that I totally forgot I had to use the bathroom earlier. I sipped on my gel and drank water from my handheld. I had also been taking cups of water occasionally to refill my bottle. I never walked through the water stations. I would unscrew the cap leading up to the aid station and stick the cap in my mouth while I handled the bottle, cups and my gels. Mifflin Street was flat for a bit and then I saw the Capital ahead, speckled with runners leading up to it. Were they headed up that hill? Ugh, really? People were walking all around me. There weren't too many spectators around and I think that others were saving themselves for the crowd at the finish line. A few runners were walking that were with the 4:00 pace group earlier. And now they were behind me. That hill was still head. Right in front of me - glaring at me. A took small excruciating steps up that hill. A man stopped in front me and bent over to touch his toes and stretch. Bent in half, he looked up at me. I looked at him and shook my head in disgust - I was miserable. I shortened my stride and tried to relax my arms. I tried to keep good posture, but it was nearly impossible. Gotta. Get. To. The. Top. That hill was cruel, but I conquered it. Almost to the finish. 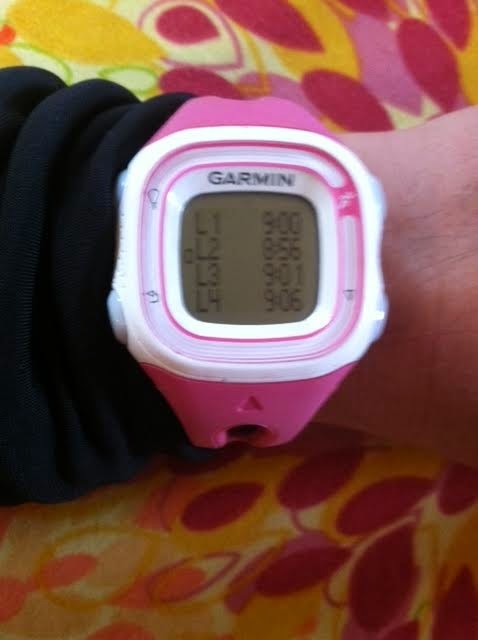 Each mile marker had been off with my Garmin. A race is usually measured from the absolute shortest portion of the course, taking corners well. 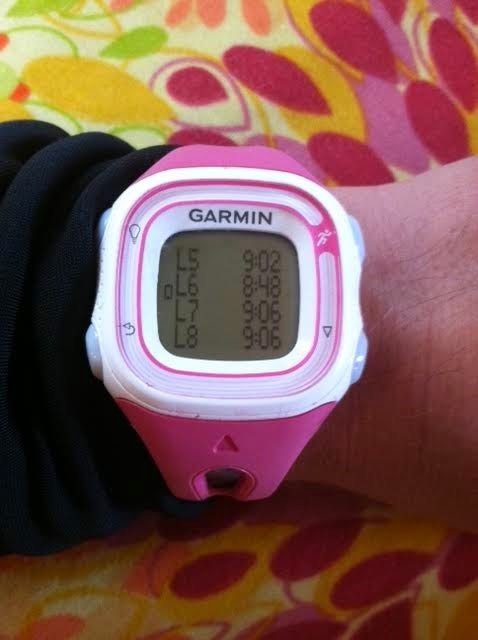 So, a long-distance race tends to measure long. 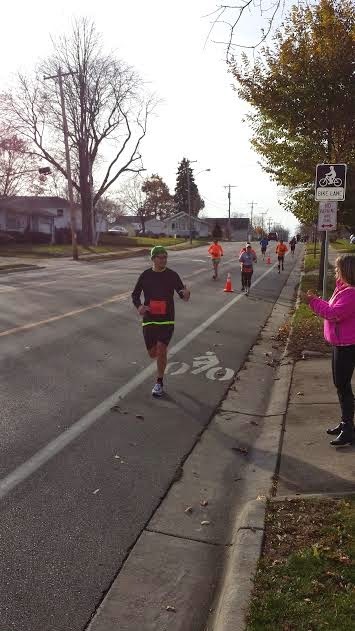 I was off by .05-.12 at each mile marker, which was deflating. I knew that the finish line was near, but didn't know exactly how near - or far. Mile 26 was straight ahead. A car was stopped in the road with a police officer chatting with the driver. This driver was frustrated that he could not get through. Yet he was stopped in the middle of the road - and the course. I ran in front of the car and the car started moving forward. The police officer slammed on the hood of the car and yelled at the man as I ran past. I saw a guy to my left, clapping and cheering. I had seen him spectating several times on the course and smiled and nodded each time to thank him. This time I wasn't smiling. I could hear him over my tunes, "It's OK to smile this time - you've got this!!". So, I did. 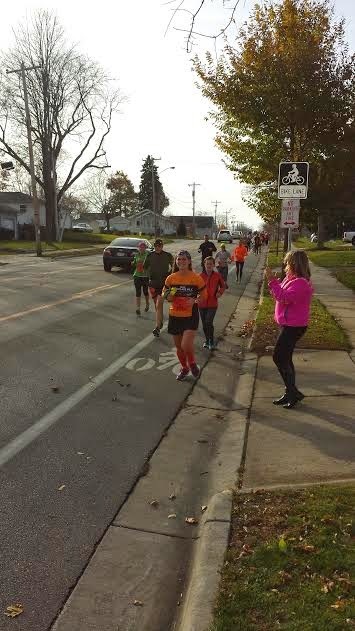 I got a burst of energy as we turned onto the short stretch on State Street. I saw the Capital and then runners in front of me turning to the left. I saw the finish line. I saw my parents and gave a pump with my arms and my fist. I smiled the biggest smile that I could muster. The marathon time clock was approaching 4:05 and I knew that my chip time started at least 15-20 seconds after the clock had started. I was going to run sub 4:05. I pushed and I pushed. And, I smiled and I smiled. I stopped my watch and then stopped in my tracks. Over four hours of running non-stop. And now was done. I stopped. I could barely move. I was a bit in shock (mentally and physically). I volunteer placed my medal around my neck and gave me a glass of water. I began walking through the finisher's cute. 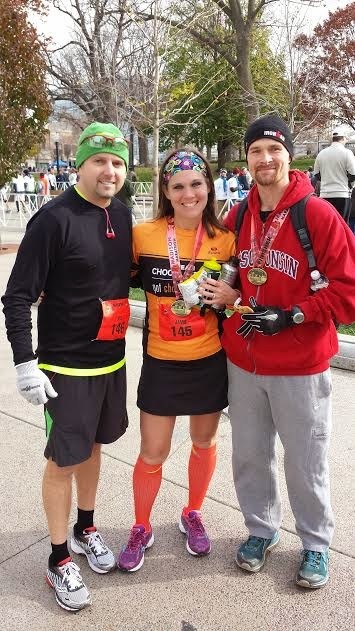 My friend Michelle had just finished the half marathon and came up to congratulate me. I must have looked out of it, because she asked if I was ok. She embraced me and I cried in her arms. That course was tough - and I did it. She said that it took her four hours to walk the half marathon. Another friend, Tiff, congratulated me from the other side of the fence. 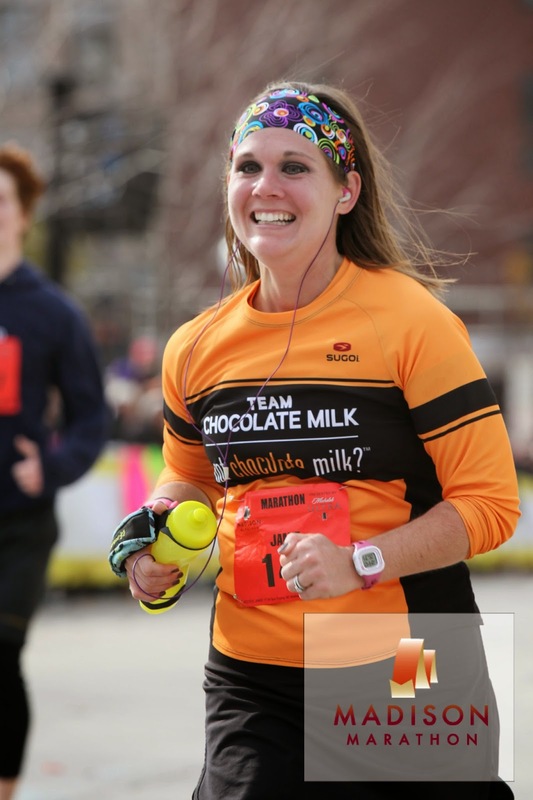 Michelle let me walk off on my own and I meandered over to get my finishers photo, some potato chips and my chocolate milk for refueling. The finisher's chute was long and I wandered out onto the Capital Square and then all the way back to my parents. I spotted them near the finish line and grabbed my dad and just cried and couldn't say a word. And then I muttered, "That was so hard!". 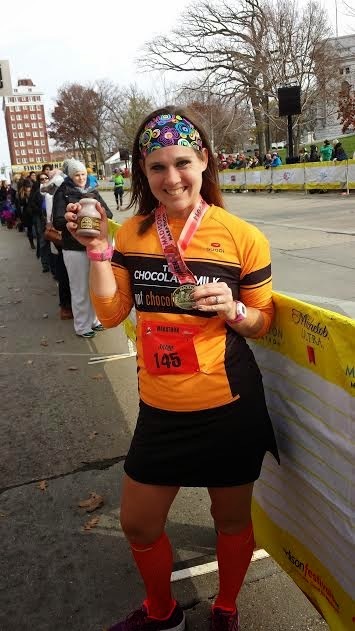 I never hit the wall, or felt a lack of energy, but the hills on that course were difficult and extremely challenging. And they occurred over and over and over - especially the last ten miles. 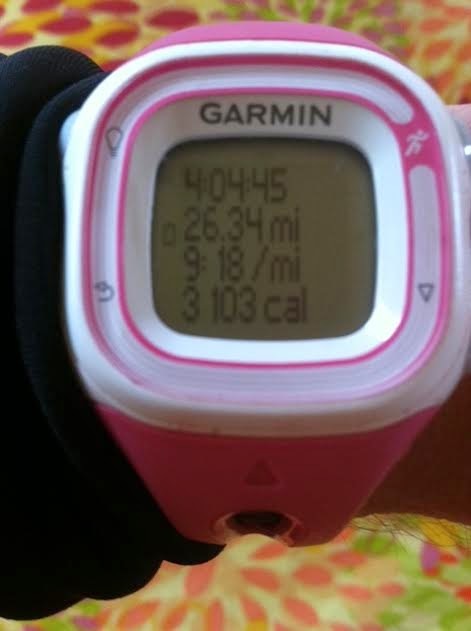 And surprisingly, I almost reached my PR time, which was earned four years earlier on a flat course. After I pulled myself together, my dad gave me his jacket. I hadn't had the energy to go find the bag drop with our warm clothes in it. I wanted to find my husband. I had no clue where he was. I hadn't seen him since mile 14 or so. Our friend, Dwight, had finished about fourty minutes ahead of me and I was told he was running the last few miles of the course looking for my husband. When he returned without a report, we were worried. Dwight went to the first aid tent and they reported that they showed him crossing the 30K mark in their sytem, but didn't know where he was at on the course. Eventually we found out that his feet and legs were in so much pain from that injury, that he had pulled out from the race around mile 21. They were driving him into the finish. We ended up reuniting a few minutes later and hugged and embraced. I was so sad that his body didn't allow him to finish the race. But I was so excited about my accomplishments that morning. It was such a moment of torn emotions. He said that his foot was in so much pain, that he had walked his last three miles after multiple stretching attempts, and couldn't walk the last five+ miles in. He didn't want to injure himself further - just for the medal. It just wasn't his day. He quickly asked me how I did and gave me the biggest smile, a kiss and a hug, while he congratulated me. I love local races, when you know the sites and the route. I love when you have friends and family around to support you. The volunteers were great. The aid stations were well managed. The medals were impressive. The race photos were downloadable for free. The course conditions were great. I could have done without the wind. The hills were brutal, but make me even more appreciative of what I was able to accomplish on race morning. Run your race. Run your pace.